Home . Necklaces . Rings . Bracelets . Bangles . Beads . Earrings . Buying . Contact . About Us . This Diamond Egagement Ring is individually handmade, slightly irregular, lightly hammered & hand brushed, for a satin finish. 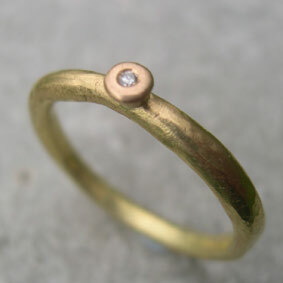 1.5mm Diamond - in a gold pillow setting, on 18ct yellow gold 2.4mm x 2.4mm ring. This diamond is of GH/SI quality, clear, bright, and conflict free. We guarantee to make your ring a perfect fit. Gold prices have been volatile recently, if prices change, due to the gold & silver markets, we will email or phone you, to discuss and get your approval, before proceeding with your payment.